Yesterday I took my abridged (but including tree kibbles) tree planting kit to Loma Vista Park and met the crew busy digging a really big hole for a really big Hedge Maple. This tree doesn’t honor any person, group or event; this Susie tree is testing the neighborhood. In years past there has been a lot of vandalism of young trees and Urban Forestry has been hesitant to keep planting. We decided to find out if a fully tree-grammed Susie tree would turn tree vandals into tree lovers. And I know if something happens to this tree it will hurt only me and not someone I want to give happiness or comfort to. I drew and wrote and quoted and strung a dozen tree-grams to hang in this brave tree and then painted a stone to place at its roots. One of the arborists lives close by and will walk his dog by the park and keep a close watch on it. If this experiment works we have more plans for this park. Go, Susie tree, go! This is a tall tree, in fact, as tall as the line of trees it is now a part of. Those trees were planted 30 years ago and I asked if they were a smaller type of tree. The answer was no. They were improperly planted too deep and have never reached their potential. I’ve often told people not to plant too deep and now I can seen the consequences. Since I have more than 200 stones to paint I try to do a few every day. I was talking to a friend who watched me paint on Monday and she said she would fool around with ideas until she found a design she liked and then she would get them done assembly line style. Not me. Every stone will be different, although I might make some with similar ideas. 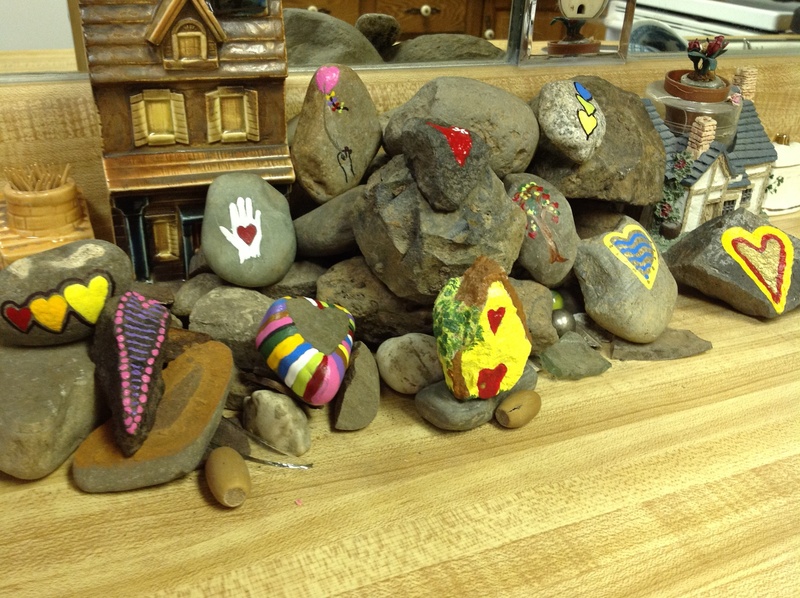 I like to look at each stone and see where the heart is and then paint it. I couldn’t do the same design over and over again. Henry Ford wouldn’t agree but I’ll have a fun time. And since I’ll never stop planting trees I’ll never stop designing. After the tree planting I went to the Shadle Library and let the manager choose which stones she wanted me to place by the two library trees. That was fun and then I walked into the park to look for the the three trees that are planted there. I found the first right off and gave it a stone. As I headed down the pathway I saw three trees that could be the second one I was looking for, so I searched through the lower branches for signs of tree-gram holding twine. No luck. I think I’ll give the stone to the family and let them place it. But I do need to figure out which tree it is. I couldn’t find the last. I planted it for a Shadle High ecology student and I feel sure we planted it further away from the play area than the only tree that was a candidate. The school made renovations to their playfields and there might have been some tree removals. I’ll have to find out. 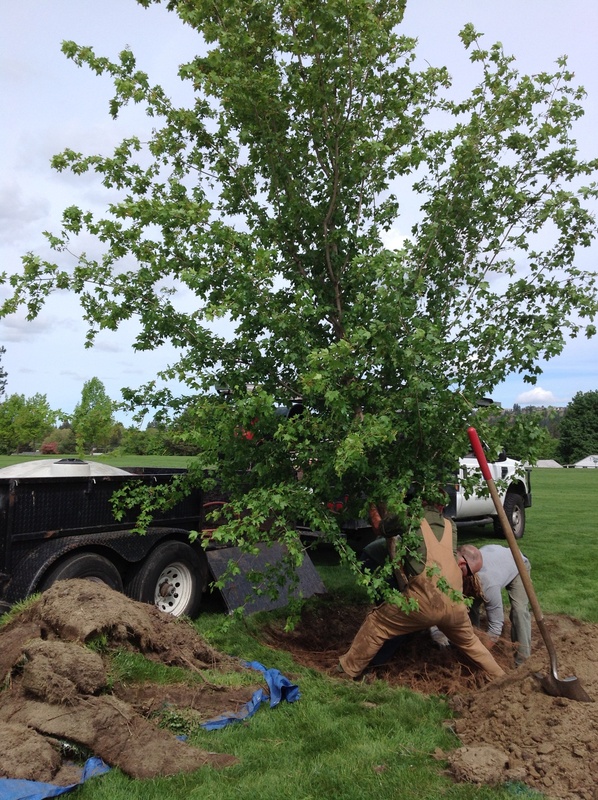 There are, as of yesterday, 223 individual Susie Forest trees and three groves in the city of Spokane. Some I see and check on often and some are in areas I don’t visit on a regular basis. Placing the stones will take me back to some of these. I hope I can find them all. May I Talk About Trees?